Last night a friend posted a clip from the 2003 Italian film, Ginger and Cinammon, on her Facebook wall. The clip features “Ta ra ta ta,” a song by Italian pop singer Mina. When I was in college, I very briefly toyed with the idea of learning Italian. (Ultimately I decided that my GPA being decent was more important than learning a language.) That is when I first saw Ginger and Cinnamon and tons of other Italian films that I often forget that I have seen. And it also when I was first introduced to Mina Mazzini. 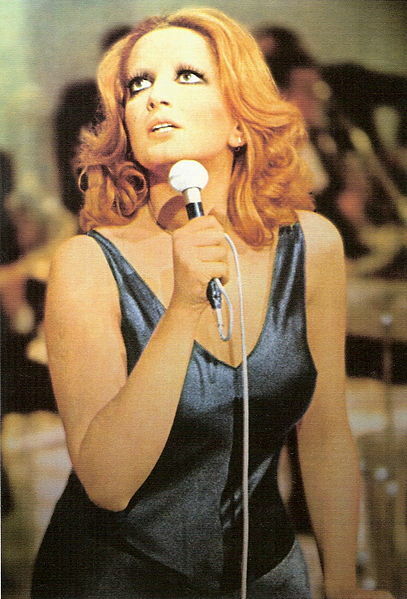 Mina began appearing on Italian variety shows in the late 1950s. In 1963, she was briefly banned from performing on public television and radio stations because of her refusal to hide her relationship (and subsequent pregnancy) with married actor Corrado Pani. This didn’t affect her popularity at all and she returned to television a year later. Her style in the 1960s revolved around her bad girl appeal: dyed blonde hair, shaved eyebrows, and smoking. Mina stopped performing publicly in 1978 (though she released footage of her in the recording studio in 2001) and she releases an album every year. Basically, Mina is great singer. If you haven’t listened to her before, you should. There are an abundance of clips on YouTube you can watch.